Now that we all live in a digital universe, we're both acquiring and creating media at an alarming rate—media that requires vast amounts of storage space. And we suspect that pictures and videos of family and friends are quickly filling up your current storage. Or maybe they live on an assortment of external drives and thumb drives. That's all good. But if a drive fails, your entire collection of movies, photos, and music could be lost. 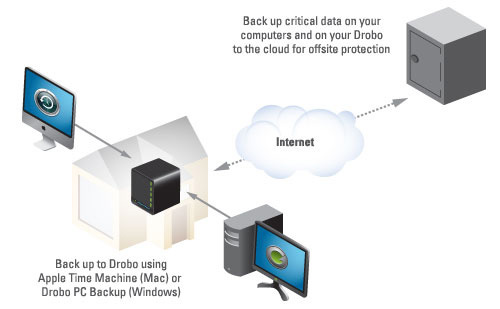 Drobo avoids the hassles, confusion, and tangle of multiple external hard drives. And ever better, you can spend more time doing what you love and less time reading your storage device's instruction manual. Drobo was designed from the ground up to be simple enough for anyone to use. If one day you realise that you need more space, simply insert another hard drive or replace your smallest drive with a larger one. Drobo is the only instantly expandable redundant storage solution.